Faithfuls!! This is my seventeenth post, and I have somehow gotten over 1,200 hits to Girl Versus Kitchen! That's over 75 hits per post so far! I'm so grateful and appreciative! THANK YOU!! So - let me know who you are! Follow me! Tell your friends! Comment! Tell me what you'd like to see! Guest Blog!! I'm open to everything and anything. Since this blog is starting to see some serious traffic, I'm going to be stepping it up a bit - making it look cleaner and more attractive, getting networked with other foodies, etc etc. So please, help me out - and let your voices be heard! And of course, keep reading! I know some of my recipes may not appeal to you, but let me know what does and I'll blog about it! The following is a recipe I found on allrecipes (link) and that I slightly modified to suit E and my tastes. Um. LOVE. E and I are both crazy about it; and the keys lie in three specific items: First, the chicken you use and how you cook it. Second, dill (fresh or dried, I've used both) and lots of it. Third, crumbled feta cheese and lots of it. Enjoy. And, let it be SPRING already! First step is roasting your chicken. You can either use three cups of leftover roast chicken, or you can do what I do and buy three bone-in breasts purely for your chix salad. The reason I prefer these to boneless-skinless is because the meat (and this is true for pork and beef too) is much more tender and flavorful when cooked with the bone. The perfect method to roast your chicken breasts for this purpose can be found here. LINK: http://www.chow.com/food-news/54292/the-basics-how-to-make-roasted-chicken-breast/ (consider going to "view all steps at once" so you don't have to click through). Chow is a wonderful resource for recipes, restaurant reviews, and all sorts of foodie-type-things. Their "The Basics" pieces are staples in my kitchen, and they should be in yours. "We outline the steps that get you from something raw to something cooked using simple ingredients, free of measurements and complicated techniques. A method that you can have in your back pocket and whip out whenever you like. We call it recipe-free cooking." Who can beat that? So, bookmark this page on how to roast chicken breasts (linked again) and make this your step number one. Cut up your cooked chicken, or shred by hand (I prefer the latter to make it look more home-made, and have a more authentic mouth-feel). 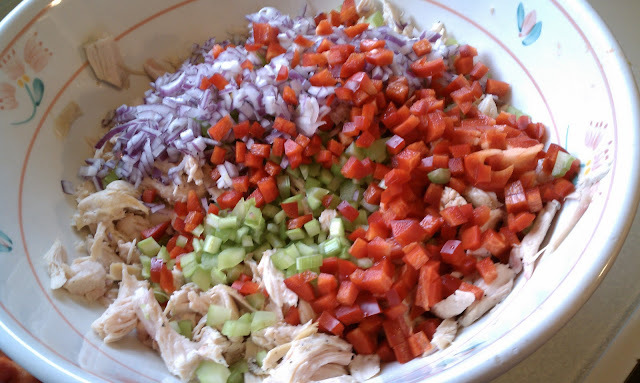 Then add your dry ingredients - pepper, onion, celery. Then add your feta and dill, and mix loosely with a mixing spoon. Finally, blend your sour cream, mayo, and lemon juice separately, and then gradually add to your chicken salad. The last thing you want to do is destroy your meal by making it too soupy. Mix little by little, and once it reaches the consistency you want, leave it and throw the rest of the sour cream mix away. Season with salt and pepper. Things you may also want to add - that I have not yet tried, but I intend to: crunchies like slivered almonds or sunflower seeds, and fruit: halved seedless grapes, mandarin oranges, golden raisins, apple wedges. 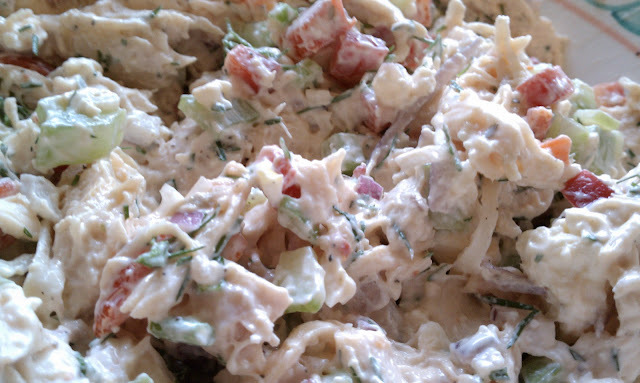 You may want to add the fruit immediately into the chicken salad you're using, as I cannot vouch the fruit will stay as fresh as intended being stored in the fridge. You may not want to add all that fruit at once; try two types together at most. Enjoy this piled into a pita, on some nice bread with lettuce and tomato, or scooped onto a garden salad. Eat outside, in pools of sunlight, enjoying the gorgeous springtime. Or at least think of it. This looks phenomenal! 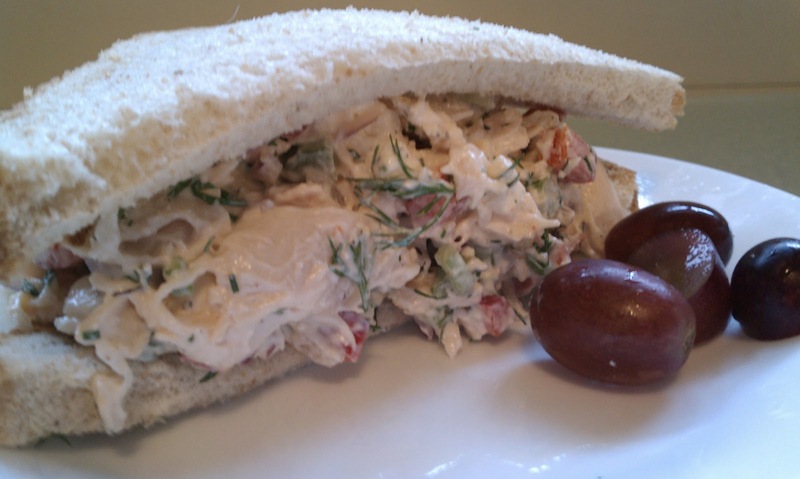 I'm going to add it to our menu next week...probably in whole wheat pita pockets :) My usual chicken salad uses cherries and walnuts, so this will be a new twist! Keep the recipes coming, girl! NYC Cooking Class.. I Wish. Peanut Butter Banana Sundae - and Welcome, April!